This review is about item#3356647. We do not have any problem on quality, we use it because it can be obtained cheaply and quickly. This review is about item#19253142. I buy it every year, I feel that it is a satisfactory quality functionally. Since it is measuring the water pressure, it seems that it will not come if it is attached to a cold winter. This review is about item#3356586. 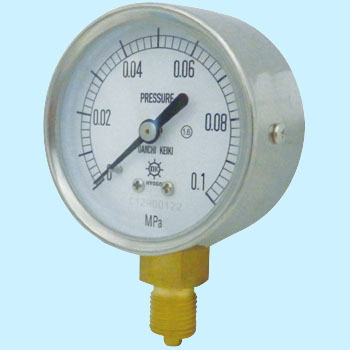 Because the measurement range of the pressure gauge was made small, proper pressure measurement was possible. Although the exterior was good with stainless steel, the part of the screw was receiving rust for chrome plating. I thought it was disappointing there. (The use period is about 3 years inland and is used for residential area storage (wet in heavy rain). This review is about item#19253185. Despite being inexpensive, there were no problems in terms of function. Attention is necessary because there is a difference in the size of the connection part. This review is about item#03356656. This review is about item#03356674. Although the price is cheap, pressure gauge accuracy can also be used without problems. For photography, I'd like to purchase a little larger gauge part next time. This review is about item#03356647. I irrigate it with an infusion tube, so I need a pressure gauge for hydraulic pressure very useful.The previous pressure gauge used for 15 years It became old and the pressure got erroneous, so it replaced it . This review is about item#03356604.